Porsche 911 Targa Performance, Engine, Ride, Handling | What Car? Firstly, let’s examine the pub-talk platitude that the 911 Targa isn’t as good to drive as the 911 Coupé. It isn’t, but everything is relative. The Targa body is a fair bit heavier than the Coupé’s (by around 90kg) and the Cabriolet’s (by around 20kg), and that’s before you factor in it’s sold in four-wheel-drive guise only (badged Carrera 4), which adds even more weight relative to the two-wheel drive versions (badged Carrera 2) of the Coupé and Cabriolet. Simple physics dictates that extra weight will make it accelerate, stop and turn less keenly than the Coupé. The chassis is also less stiff than the Coupé’s and that affects the suspension’s settings, which in turn, affects how the car handles. So the differences are real, yet comparatively small in the real world: the Targa is the most compromised of the 911s, but unless absolute driving dynamics are your master that may not worry you. And despite this, the Targa is still one of the most sorted open-top cars you can buy at this price range, and a better drive than the SL or F-Type. 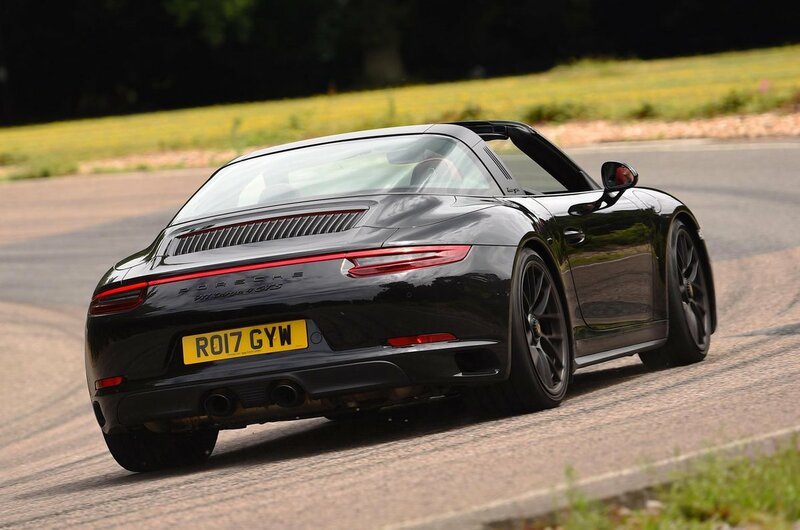 The entry-level is the Targa 4, equipped with 365bhp and a seven-speed manual gearbox. It would be absurd to call it slow – it does 0-62mph in 4.7sec – but of all the Targas this one feels the least energetic next to the Coupé equivalent or its key rivals. Surprisingly, you find yourself really ringing out the engine to overtake on a country road, but that has its benefits: the accompanying howl from the flat-six engine is a treat. It’s still the one we’d recommend after you’ve factored in costs. That’s because moving up a rung to the 414bhp Targa4S requires a big chunk of cash, and while the performance ratchets up considerably - feeling more inline with what you’d expect of a pedigree sports car - just factor in if you’ll get the opportunity to use it. The GTS version is the most powerful in the range. Porkier than other 911s it may be, but this Targa is still blisteringly quick; to the point there’s little else for the money that will keep pace with it. Whichever engine you choose, adding the PDK automatic gearbox makes it faster still. That’s because the auto ‘box is so quick at changing gears that us mere humans can’t hope to match it with a manual. Even so, the added interaction the manual offers to the driving experience, wedded to the slickness of the shift, means it shouldn’t be discounted if your 911 is mainly for high days and holidays, rather than everyday commuting. Having established that the Targa’s handling is diminished slightly next to the 911 Coupé and Cabriolet, rest assured that it’s still mighty. With sweetly weighted steering lets you glide it intuitively through S-bends and superb body control (especially with the standard PASM adaptive dampers in firmer sport mode) it easily outclasses the SL. And even though an F-Type Roadster also steers well, it feels heavier still and less nimble as a result. 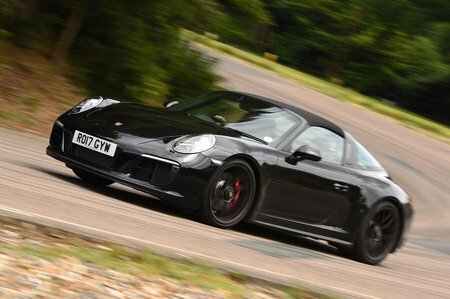 The Targa’s standard four-wheel-drive might reign back some of the playfulness delivered by the rear-drive 911s, but it does make it particularly surefooted, even on greasy roads. The Targa’s ride is also supremely well judged. Firmer than an SL, but with better body control over crests and dips plus far less shimmy through the body across scrappy roads, it’s more comfortable. Road noise is a problem at speed - the same is true of its rivals - but with the roof up, wind noise isn’t too bad. With the roof down it’s fairly noisy but there’s not much buffeting.